With a single drop of blood and a few minutes time, a new diagnostic system could detect a wide range of diseases. The “clinic-in-a-box” combines immunoassays, clinical chemistry, and more into a single diagnostic platform that could be used while a patient waits in the doctor’s office. Developed by an Irish company called Radisens Diagnostics, the test is also being looked at by the European Space Agency. The push towards rapid, point-of-care diagnostics has been building for some time as changes in the healthcare environment trend towards lower-cost, higher-quality treatment. Traditional lab tests require wait times of up to several weeks, since they require analysis in large diagnostic labs where the actual test is performed. Diagnostic capability on-site at the physician’s office would eliminate a significant portion of the logistical and capital costs involved in today’s environment, while allowing immediate results to be obtained. In addition to the office setting, eliminating the need for a supporting laboratory could be useful in places like space stations, according to a recent article from CNN. The researchers at Radisens wanted to develop a more rapid approach to diagnosing diseases, which appeared to be a significant unmet clinical need. "The physicians were crying out for a simple-to-use device," Jerry O'Brien, the owner of Radisens, told CNN. "There was a huge unmet clinical need. It was very obvious from the start they wanted a simple device that would test for any condition off a finger-prick of blood within a matter of minutes." To address that need, the company developed its Gemini platform, which has benefited from many breakthroughs in nanotechnology. 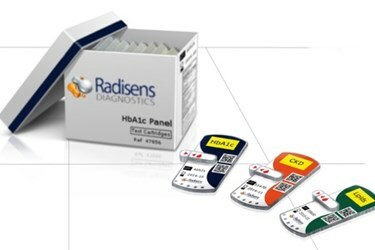 According to the Radisens website, the diagnostic device comprises centrifugal microfluidics, multiplexed immunoassays, optoelectronics, and turbidimetry technologies. The device is multi-modal and targets chronic disease management for diabetes, heart disease, and chronic kidney and liver diseases. The technology has shown sensitivities that are better than an impressive two picrograms/ ml, according to Radisens. Additionally, large capital costs are eliminated, along with extensive quality assurance programs and complex protocols that require significant operator training. Funded by the European Space Agency in 2011, Radisens recently received another €1M contract from the agency to continue its development project. Rapid point-of-care diagnostics would be a significant addition to the healthcare environment, with several cost and convenience benefits. There are several other clinical scenarios that could benefit from rapid diagnostics in a way that would more directly impact a patient’s health. For example, sepsis is a rapidly accelerating clinical condition that can significantly worsen by the time a traditional test is complete. Another disease that can spread rapidly is the Ebola virus, and a rapid test could help contain it.